A Krabi Phi Phi Island tour is one of the finest way to visit Koh Phi Phi and see the best it has to offer without staying the night. Krabi is a beautiful province in it's own right but the 20 km of coral seas around Koh Phi Phi offers something more. The Krabi Phi Phi Island tour takes you from the Ao Nang region of Krabi where all the main resorts are located. It first heads out past Railay beach and the towering cliffs of Phranang where famous climbers come and relax after scaling the Himalayan giants. Railay beach has many low rise bungalow resorts fringing some of the most enchanting scenery in southern Thailand. Out past a series of local coral islands including chicken island with it's iconic chicken neck pillar you get a feel for more to come. The first part of Koh Phi Phi you spy is Bamboo Island and Mosquito Island and the remote Leam Tong where the best luxury resortsare hidden away. As you move down the corralled east coast you come to Hin Phae or Shark Point at the corner of Long Beach. Here the famous Long Beach hotels look out over Tonsai Bay and Koh Phi Phi Ley on the horizon. From here you cruise down to Phi Phi Ley and arrive near the Viking Cave where they farm the birds nest in the famous Birds nest soup, a Chinese delicacy that dominates the importance of the island. Unaided and with little or no modern technical help the local Phi Phi inhabitance scale the cliffs here to prize their red grey treasure from cliffs. Pi Ley is the next inlet of great interest and this near perfect lagoon has the most perfect echo. Loh Samah is a reef, an inlet, beach head and a top snorkeling stop for those who love tropical marine life. Maya Bay is the site where Leonardo Di Caprio shot the movie The Beach about a group of wayward travellers in search of paradise perfected. This truly inspiring bay with it's 3 beaches and coral reef is worth spening time to explore and taking in the grandeur. 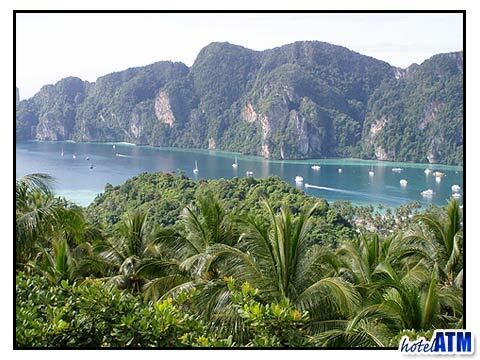 The Krabi Phi Phi Island tour by big boat is a wonderful cruise out over ocean at a pleasant pace. The large amount of space gives you the chance to walk the decks or even sunbath on top. This tour is more a mixture of sight seeing and snorkeling with a lunch stop. The Krabi Phi Phi Island tour by speedboat gives you all the thrill of the speed going out over the Andaman sea, the rush of skimming over the deep blue sea.The advantage of the speedboat is that you get to Phi Phi quicker than the big boiat which gives you ore time at the islands. It also gives the captain more opportunity to use bay and reefs that a larger boat cannot access.